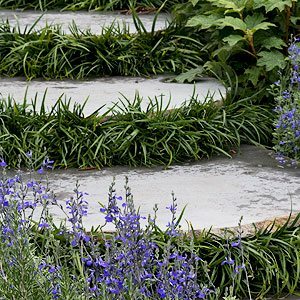 Garden paths with pavers or stepping stones can be a weed haven, its the gaps that need filling. By filling the gaps with plants it makes it difficult for weeds to get a chance to establish. Choosing the right plants for between pavers is the first step. The plants you choose will depend on your climate, your soil and also how much the path is used. Most are creeping types, those that spread by runners, or underground rhizomes. For paths that are used regularly, you need tough plants than can be stepped on without to much damage. Other lightly trafficked areas can be treated differently. Try to look for slow spreading plants to avoid them escaping into garden beds and lawns. Low maintenance, plants are best suited to most applications. So here is out list of the best plants for between pavers. For areas with traffic, we do like the Dwarf Mondo Grass, it is low growing, it will stay green year round and it will cope well in part shade as well as full sun. It does not encroach on the pavers so it makes walking over them easy. Dymondia margaretae is another for similar areas. It is very low growing, lower than the dwarf mondo grass and it also flowers. The small yellow flowers in spring are a great addition, however its tidy habit is what makes it a winner. Thyme species have a lot to offer, Thymus serpyllum and its cultivars are very good. Fragrant foliage and tough in full sun. It will encroach onto the pavers as its a trailing plant, so a little upkeep may be needed. Thymus languinosus or Woolly Thyme is another to consider, it is a little taller, but pink flowers are an added attraction. In shaded areas, you could use moss, it is a natural for this sort of situation. Another for damp areas is the Corsican Mint, (Mentha requienii) it is very low growing and fragrant when stepped on. Irish moss (Sagina subulata) is worth considering as well. Chamomile (Chamaemelum nobile) with its green foliage and smal white flowers is also worth considering, however it does need a little pruning back once a year, it also needs moisture. Pratia peduncuata (Blue Star Creeper) is another that spreads a little to quickly. Creeping Jenny or Lysimachia nummilaria ‘Aurea’ is also suited, however only if the gaps between the pavers are large as it needs the space.